The ultra-compact size and yet the high level of performance. These sensors save space. A high resolution of 4 μm 0.157 mil (at an average 64 cycles) allows high-precision positioning and size judgment. 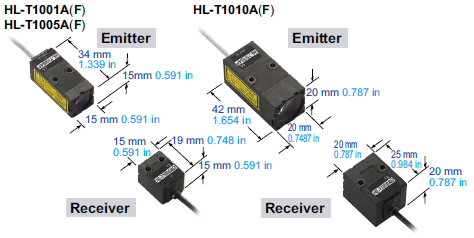 Long sensing range of 500 mm 19.685 in [HL-T1005A(F), HL-T1010A(F)] and 2 m 6.562 ft [HL-T1001A(F)] are available. The sensors are sensitive to minute differences in light intensity, so that they can judge even the opacity of glass. In addition, the amount of light received can be displayed as a percentage to allow you to determine permeation rates. 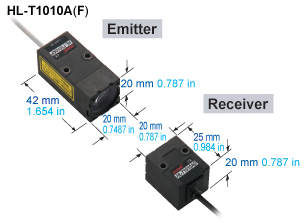 The laser with a beam diameter of ø1 mm ø0.039 in can sense extremely small objects with dimensions in micrometers such as bonding wires. 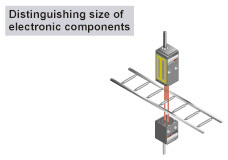 The adoption of a Class 1 laser (IEC / JIS) eliminates the need for safety countermeasures, so that these sensors can be used in photoelectric sensor applications with confidence. A wide range of convenient features has been incorporated into the unit's compact body: standard laser beam reception intensity setting / auto scaling setting / measurement processing (various timer and hold functions) / differentiation / monitor focus function. These features make the unit useful for a wide variety of applications. The current resolution can be easily confirmed by setting the controller to indicate resolution display mode. 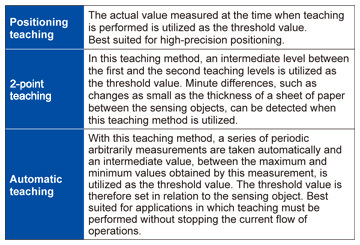 By displaying the resolution, the marginal increment can be easily determined for the threshold value setting, helping to accurately determine whether sensing can be performed. 3 types of teaching functions are available: positioning teaching / 2-point teaching / automatic teaching, thus enabling a variety of applications to be accommodated for many different types of production sites. The analog output can be switched between either of two different outputs; current (4 to 20 mA) / voltage (±4 V). With the monitor focus function, the output can be adjusted over the range from -5 V to +5 V, or from 0 V to +5 V, facilitating connectivity with a variety of output devices. 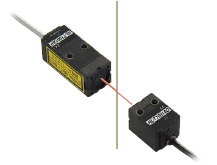 The linear output is fully adjustable over the following range (current: 4 to 20 mA / voltage: ±4 V). The usage of the monitor focus function together with selectable current / voltage switching for the linear output allows for compatibility with a variety of output devices. 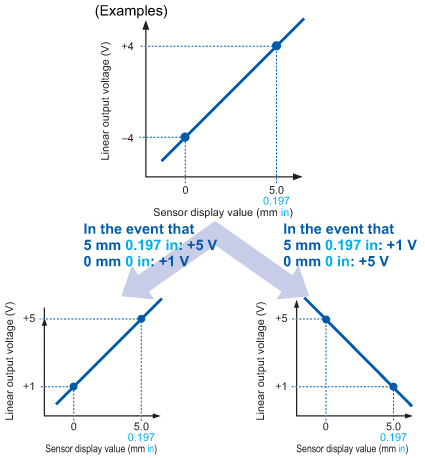 The linear output must be set by determining output values (maximum; current: 0 to 23.5 mA / voltage: ±5.5 V) at two different points, for the arbitrary display value. FDA regulations conforming types, most suitable for equipment used in the USA, are now available. All settings can be easily performed by using the fourway keys and viewing the digital displays. The calculation unit (optional) just needs to be connected between the two controllers to enable calculations (addition and subtraction) to be carried out for two sensors. No digital panel controller is needed either. 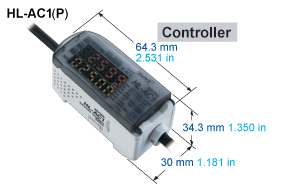 The intelligent controller performs self-checking for laser diode deterioration. 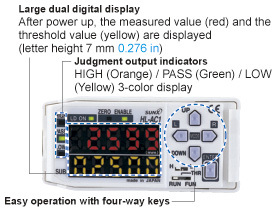 If the controller detects significant deterioration (end of diode life), an error will be displayed on the main digital display panel. This function enables users to prepare in advance for potential laser diode malfunctions.